Back in 2015, Dodge decided to add even more horsepower to the Challenger lineup and released two new Challengers with SRT engineering and design – the Dodge Challenger SRT 392 and the Dodge Challenger SRT Hellcat. “SRT” stands for “Street and Racing Technology,” and its a high-performance auto group within Dodge that designs special components to optimize vehicle performance. It began as “Team Viper” when the Dodge Viper was being developed, and first used Chrysler’s SRT8 engines to as a starting engine platform. The 392-cubic-inch HEMI engine was developed by Chrysler in 2005 and had a conservative output of 525-horsepower and 510 lb-ft of torque. When they started putting the engine in vehicles, namely the SRT8 Dodge Charger, Chrysler 300C, and Jeep Grand Cherokee, the horsepower was dialed back to 470-hp. Now in the third-generation Dodge Challenger, the engine is a 6.4-liter V8 SRT HEMI engine that produces 485 horsepower and 475 lb-ft of torque. The same engine is also available with a multi-displacement system (MDS) that helps improve fuel economy. Buyers have the option of pairing the engine to a TREMEC six-speed manual transmission or the TorqueFlite eight-speed automatic transmission. When paired to the automatic transmission the Dodge Challenger SRT 392 has a fuel economy of 15/25 MPG city/highway, which is pretty good considering all of that power. The Dodge Challenger SRT 392 hits a top speed of 182 mph and it can accelerate from 0-60 mph in 4.2 seconds, which is 1.2 seconds faster than the Ford Mustang V6. It is also able to cover a quarter mile in 12.6 seconds; 1.1 seconds faster than the Mustang. Like its counterpart, the Dodge Charger SRT 392, the Dodge Challenger SRT 392 has been engineered with high-performance parts that improve its ride. The Challenger SRT 392 is built on Bilstein high performance suspension shock absorbers for a firm ride with improved balance, cornering ability, and steering responsiveness. To reign in the Challengers 485 horses under the hood, the Challenger SRT 392 is equipped with the SRT Track Pack brake package, which includes performance Brembo brakes. These special brakes are two-piece slotted and vented rotors with six-piston calipers that are 15.4 inches in the front and 13.8 inches in the back. Their intricate design improves heat management, thermal capacity, and longevity. Thanks to the Challenger’s aluminum axles, 20-inch SRT hyper black forged aluminum wheels, and advanced driveline components, the Challenger SRT 392 is lighter and more aerodynamic than ever. Of course, it’s fierce look wouldn’t be complete with badges and aesthetic implements such as the Challenger Grille Badge, SRT 392 HEMI Fender Badge, “SRT” Badge, and dual racing stripes (optional). 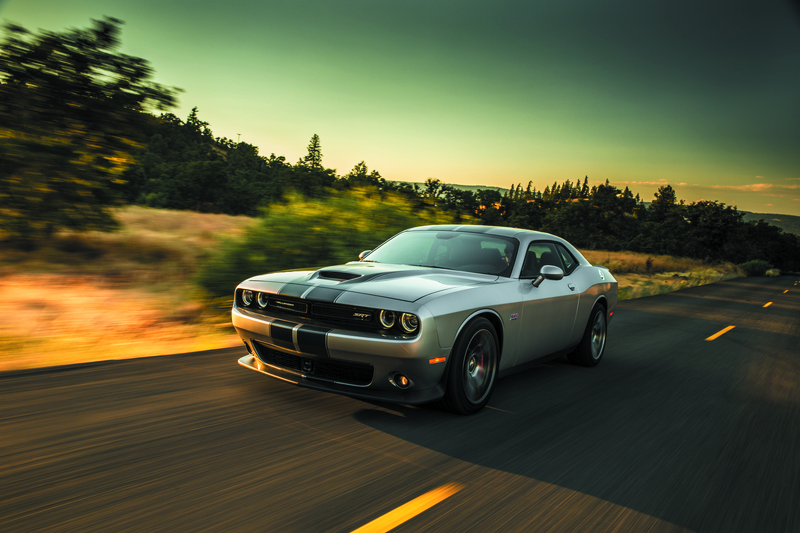 The 2016 Dodge Challenger seats up to five people and the Challenger SRT 392 has a unique blend of word-class materials and race-inspired tech to make the cabin feel more like a cockpit. Dodge brings time-tested icons and revs them up to speed of the modern day with a Class-Exclusive 7-inch reconfigurable driver information display. 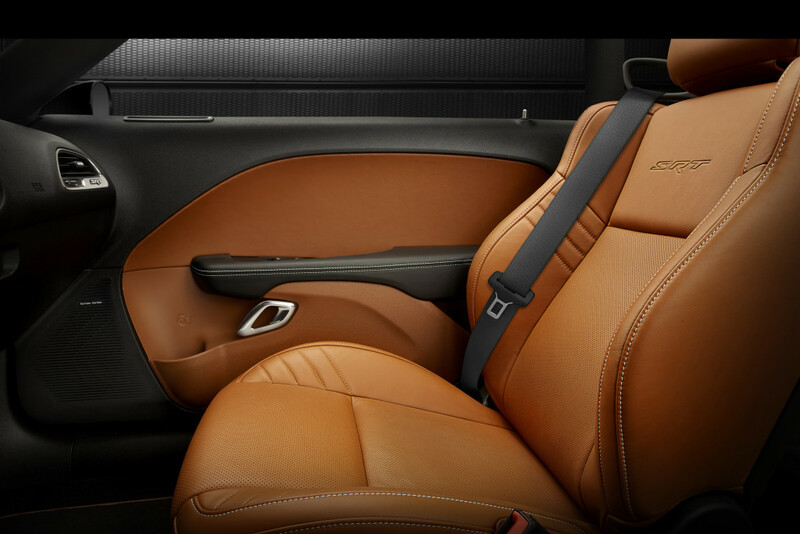 The front seats are heated and ventilated and all of the seats are covered in premium Laguna leather. 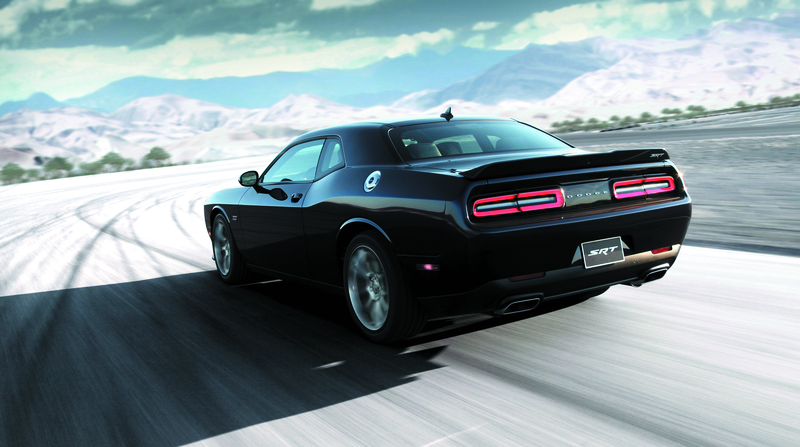 The Dodge Challenger SRT 392 has an excellent sound system so drivers can hear over the loud and powerful engine. Like the Challenger SRT Hellcat, the Challenger SRT 392 has an 18-speaker audio system with two subwoofers. Drivers can easily control the entertainment settings via the 8.4-inch touchscreen that can also display GPS navigation and Uconnect apps. As with many modern tech cars, Bluetooth Voice Command has been integrated into the vehicle for hands-free driver communication. The 2016 Challenger SRT 392 is available in twelve colors, including the special-edition 2016 Mopar color, Go Mango, and buyers also have the choice of four different interior colors. Speaking of Mopar, many performance parts made by Mopar are available to the Dodge Challenger, such as cold air intake systems, Cat-Back exhaust systems, lightweight performance wheels, and more. Nearly every safety and security feature to-date is found in the Dodge Challenger SRT 392. It comes with a basic limited warranty for 3 years or 36,000 miles, whichever comes first, a 5-year/60,000-mile powertrain warranty, roadside assistance for 5 years or 100,000 miles, and rust-through coverage for the same duration. The MSRP for the 2016 Dodge Challenger SRT 392 starts at $50,195.